Quick, who won more career games, grizzled vet Murry Dickson or HOF legends Sandy Koufax and Dizzy Dean? Like many stat questions, it's the unexpected guy, Dickson, who registered 172 victories against Sandy's 165 and Dizzy's 150. It's a solid career total for someone who didn't get going until age 29, but there's more to his story than a few good years. The "weak hitting" Pirates lineup starred (legitimately) Ralph Kiner and (sorta) Gus Bell, but dropped off a cliff thereafter. Their first and second basemen, to pick just one position, hit a total of 4 homers all year. What do you call that level of performance? "Donner-Party-esque?" But while it's true that most Pittsburgh batters couldn't hit a barn with hay-targeting missiles, this card text oversimplifies Dickson's 1951 season. 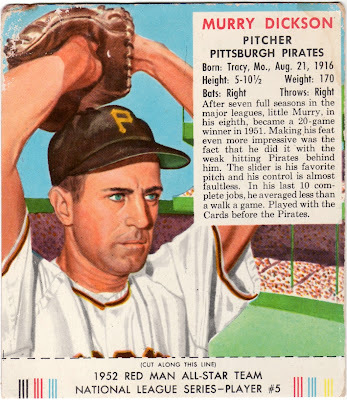 I think Murry won 20 games (against 16 losses) in 1951 by sheer volume, as he started 35 times and relieved 10 more. All that work meant bigger numbers across the board: Dickson led the league in hits allowed, earned runs, and homers, thanks to a career-high 1241 batters faced. (For comparison, only one MLB pitcher since 2005 faced 1000+, and just barely: Felix Hernandez pitched to 1001 in 2010). Someone had to get credit for Pittsburgh's 64 victories and Dickson filled the role. Good on him for sticking it out, but his 20-win season doesn't mean quite what it seems on the surface. 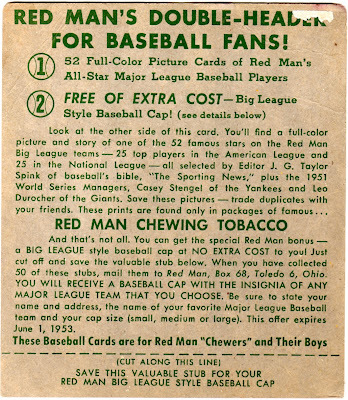 Red Man tobacco released these colorful sets of AL and NL stars every year from 1952 to 1955, fronts featuring painted players and backs with mail-in product offers. 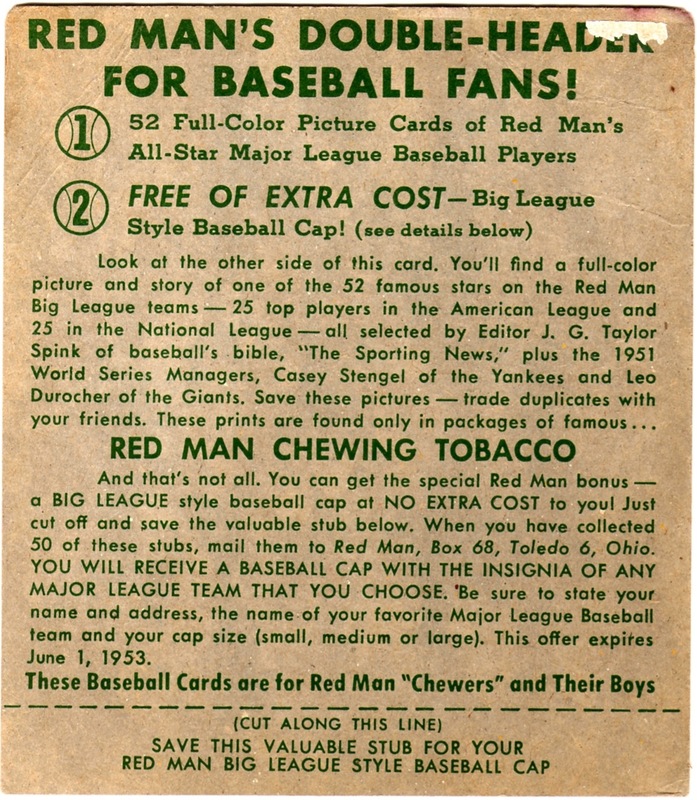 The collector-made RedManCards.com site offers set checklists and a ton of scans; check it out for more of this classic 1950s look. Value: Lesser-known Red Man players in low-grade cost $5. Note the "cut along this line" bottom border; higher-grade collectors want intact cards with a tab, so pay more for those uncut versions. Fakes / reprints: Red Man reprints exist for both original sets and as a base design for modern players. I haven't seen any fakes in the marketplace, but it's possible, given the stature of guys like Willie Mays, Stan Musial, and Yogi Berra.